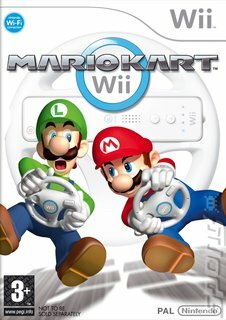 It might have felt like a long time coming, but Mario Kart has finally made it onto the Wii! In, er... Mario Kart Wii. If you've never played the game before, it's all about getting from A to B as quickly as possible. Just like any other racing game. Except... it's done in the crazy style of the Mario series. In fact, it's a bunch of crazy thrown into the crazy pot and stirred with the crazy stick. Racing as one of the characters from Mario's world, players can beat the brightly-coloured daylights out of each other with a bonanza of power-ups. So, what's new? 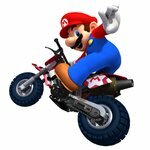 Well, aside from all the features of Mario Kart we've come to know and love (with, of course, a bunch of new tracks, characters, weapons and vehicles) we get online multiplayer. Up to 12 players get to compete together, all at once. If, however, you want to keep it in your living room so you can race your Gran', Auntie Pete and Shirley the Butcher* without seven other people interrupting, you can do that as well, because four people will be able to compete locally. 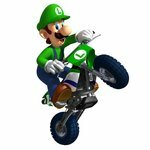 If you're worried that the Wii Wheel will cancel out the experience you've gained from years of dedicated kart racing (enabling your Gran' to kick your bottom) fear not! Nintendo confirms that the following control methods will also be on offer, Wii Remote turned onto its side, Wii Remote and Nunchuk together, the Classic Controller and even the Nintendo GameCube controller. 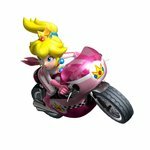 Mario Kart Wii will also get a Wii channel of its very own. 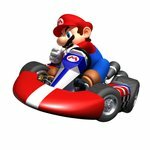 The 'Mario Kart Channel' will offer online rankings, friends' ghost data to download and compete against, chat rooms and spectating. * Insert your own friends and family names.